Chinese Chicken Corn Soup is a very delicious recipe. Learn how to prepare Chinese Chicken Corn Soup by following this easy recipe. Put the chicken in a pressure cooker along with salt, black pepper powder, ginger garlic paste and 3 cups of water. Pressure cook for 20 min on a medium heat. Now take out all the bones and make small pieces of the chicken. 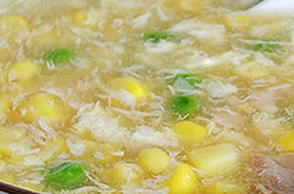 Take a pot; add chicken pieces, corn and water. Cook at medium heat for about 10 min and stir it slowly. Add this liquid to the chicken and corn. Now put the remaining ingredients. Cook at a high heat and mix salt if needed.